The horror of art... is it the horror contemporary art experiences for itself, or is it the horror it induces among its public? 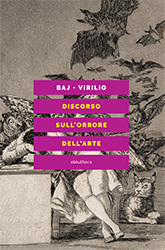 Baj, a painter, and Virilio, a urban planner, question each other regarding art's contemporary status, how it is perceived where it is located and exhibited. Art's contemporary fate and its evolution seem to constitute the privileged dimensions that are able to grasp basic traits of our times. Indeed the art market has anticipated the New Economy and other immaterial processes. Our relation to art has resulted into a sort of surplus value that has rendered useless all form of serious critique. Criticism is today reduced to gossip and self-aggrandizement, and the work of art is little more than an icon of itself. Devoid of any meaning, art is today a machine for the production of pseudo-philosophies, pseudo-aesthetics, pseudo-problematicizations. Enrico Baj (Milano 1924 - Vergiate 2003) was one of the most famous and original contemporary Italian artists. A restless and unsettling artist, he never ceased to critically reflect on the status of art. Paul Virilio (Paris, 1932 - 2018), Originally an architect, in 1963 became founder and president "Architecture Principe" and editor of the group's review. Since 1968 he teaches at the Ecole Spéciale d'Architecture in Paris, and since 1998 has been serving as its president. He is a urban planner and a writer and is particularly well known for his theory on velocity and as an expert of new technologies.